The battle of Dog People versus Cat People just got some more ammunition. New research suggests that when it comes to sleep quality, dog owners may have a leg up on cat owners. It’s the first study to investigate the distinct impacts of dogs versus cats on human sleep. We spoke with the study’s lead author, Christy Hoffman, Ph.D., program director of anthrozoology and associate professor in the Animal Behavior, Ecology and Conservation and Anthrozoology departments at Canisius College, to learn more about how our furry companions might improve or disrupt humans’ capacity to enjoy high-quality Zzzs. While previous research has suggested that sharing a bed with a pet may be wholly disruptive to human sleep, this new research found that the issue may be more nuanced than previously suspected (1). For example, in general, it appears dog owners are more likely to sleep soundly with their pets compared to people who prefer feline companions. The study, which was published in the journal Anthrozoös, analyzed online survey data from 962 adult women living in the United States. That data found that 55 percent of survey participants shared their bed with at least one dog, while 31 percent shared their bed with at least one cat. A mere 7 percent of respondents did not reside with a dog or cat. Additionally, 57 percent of participants reported sharing their bed with a human partner. Dog owners reported earlier bedtimes and wake times than people who live with a cat(s) instead of a canine companion. The researchers attribute this to the fact that dogs require earlier wake times in order to get outside and go to the bathroom. Dog owners who shared their beds with a dog generally believed that their canine friends were less likely to disturb their sleep than human bed partners. They also reported fewer sleep disturbances that dog-owning participants who did not share their beds with their dogs. The researchers speculate this might be because the presence of a dog in bed can decrease the likelihood of experiencing bad dreams, and/or dogs who are not allowed in the bed are more likely to be active at night and exhibit attention-seeking behaviors that might disrupt human sleep. Dog owners who allowed their dogs to share their beds reported that doing so was associated with high feelings of comfort and security. Cat owners reported that they believed their feline companions to be just as disruptive to their sleep as human bed partners. This might stem from the fact that cats are more likely to be active during periods of the night or very early morning. Cat owners indicated that sharing their bed with a cat was associated with weaker feelings of comfort and security compared to sharing a bed with another human or a dog. Still, having a cat in bed produced more feelings of comfort and security than not having any bed partner. Both dog and cat owners differed in opinion regarding whether they slept better or more poorly depending on whether their dog or cat was touching them. Based on these findings, it appears that dog ownership might be better for human sleep than the presence of a feline compatriot. 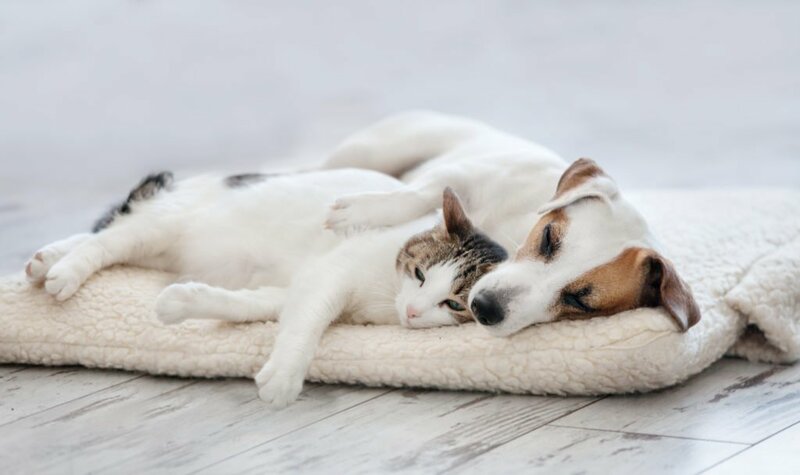 “Our data do suggest that dogs commonly rate as better bed partners than cats and may enhance sleep quality,” Hoffman says. According to Hoffman, there are several reasons why dogs might make better bed partners. Additionally, the study found that dog owners were more likely to maintain consistent sleep and wake times, even on weekends. Consistent sleep-wake cycles are a key component of good sleep hygiene and may increase the odds of someone enjoying sound sleep. Of course, that’s not to say that dogs are always a boon for human sleep. “For example, a dog who snores loudly or radiates heat in the middle of summer is unlikely to enhance one’s sleep quality,” Hoffman says. Ultimately, as in all matters of the heart, the ideal pet (and bed sharing situation) may vary depending on individual circumstances. 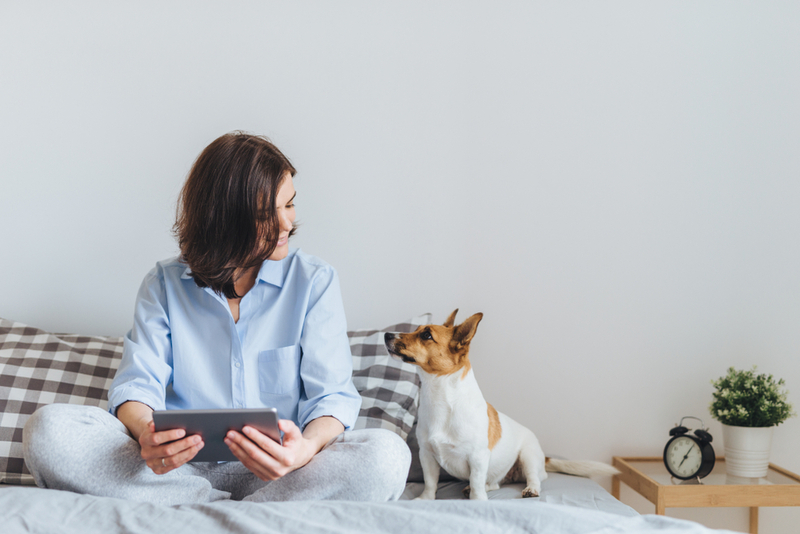 “Characteristics of individual humans and their companion animals are likely to have a big impact on whether bed sharing is ideal for an individual and their pet,” Hoffman says. While the results of this study help shed light on the potential impacts of dogs versus cats on human sleep quality, Hoffman says more research is needed in this area. “While a lot of participants in our study did perceive that their dogs had positive impacts on their sleep, there certainly is a lot of variation across people and their pets that may influence how they affect each other’s sleep,” Hoffman says. Additionally, Hoffman points out that this research was based on individuals’ subjective perceptions of how their pets affect their sleep. Given that just over half of the study’s participants reported sleep quality deficits, it’s possible pet ownership is associated with more sleep disturbances than pet owners realize.